The Road is about a twelve-year-old case which is reopened when three teens gone missing in an abandoned road. In the course of the investigations, deeper and gruesome stories of abduction and murders were discovered. After more than two decades, the secrets of the road were finally revealed and the ghost lingering in the dark and desolated pathway is out to make sure that nobody leaves alive. The Road is definitely the CREEPIEST and MOST UNIQUE Pinoy Horror Film of All-time but however not the scariest as compared with Feng Shui and Sukob. This would be the first time I'll be making a review for a Pinoy Film. And since, I am an avid of Horror Movies, it is good to make a review to Pinoy Horror Films that were somehow making a big improvement over the years. The Road's strength lies mainly on its Cinematography and Plot. I really commend how the Director, Yam Laranas and his Swedish Composer/Cinematographer, Johan Soderqvist. brought together the element of Mystery and Psychological thriller in a package wherein the whole film looks so silent yet very creepy at the same time. I really love the texture of the film. It is dark, gruesome, and scary since it brings you towards the plot of the film and its quite disturbing mood. It is intelligently crafted and technically done. 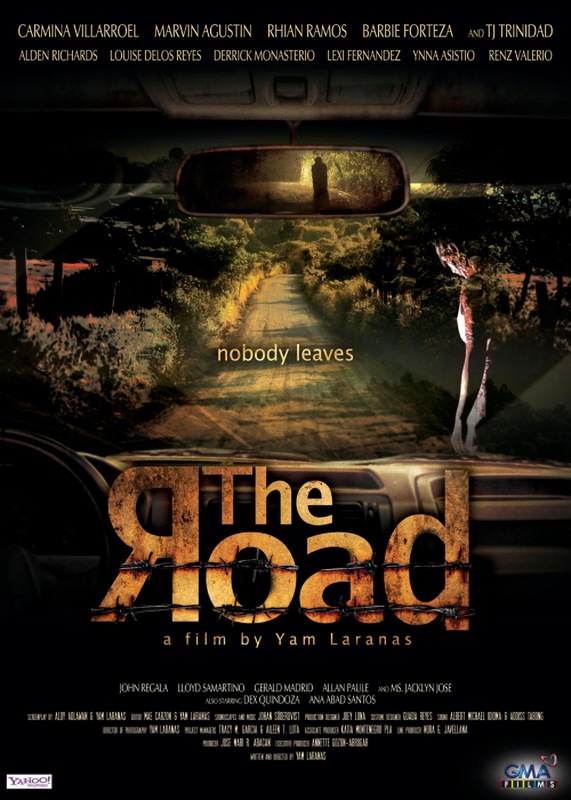 I love how Yam Laranas played the scenes in the dark especially with the road itself. Although, some Slow Motion Scenes were somehow inappropriate but it is in some way effective in bringing a whole new kind of fear. The fear of being alone in an abandoned road. The film is composed of three parts. I won't spoil the whole thing but every part has its mark of scare and disturbing scenes. Generally, the whole film in consistently creepy and dark. I am impressed with the film's technicalities and sound engineering. The progression of the scenes were also good. There are so many twists and turns especially in the ending. The plot is unpredictable (which is good for a Horror Film) but it is still solid towards the end. 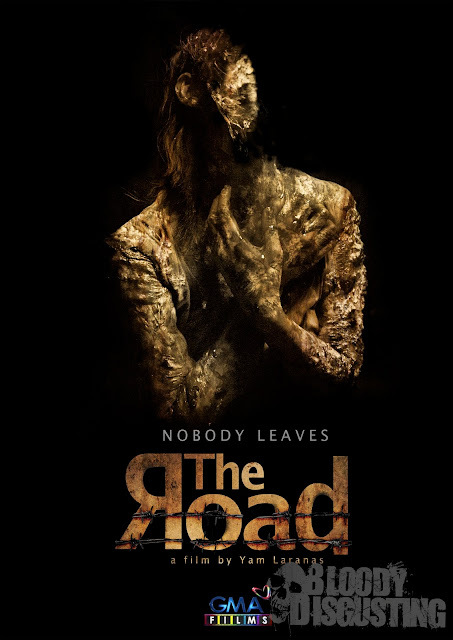 The Road is definitely distinctive due to its effective psychological approach to a Horror film. I think that only Yam Laranas could do such horror flicks. It may not boast as many jump-out scares like Feng Shui's or Sukob's but the fear is skin-deep. However, I have a doubt that some or even majority of the Pinoy Moviegoers may not find The Road a good one since we are so used with the typical flick. On some point, Yam Laranas may have overlooked on some elements such as more ingredients for every Horror Scene. But whatever it is, I must admit that The Road's premise is so promising and it is artistically done compared with other Pinoy Horror films that put their focus on jump-put scare scenes and risk their Plot and Cinematography in the end. It will give you goosebumps but it lacks genuine scares. The movie just lack impact on some scenes. The Director can do more heavy horror scenes than that. Some of the scenes are definitively scary and disturbing though. Acting wise, actors and actresses were good. I really commend Carmina Villaroel for her great portrayal as well as Marvin Agustin. Alden Richards was a surprise actor in The Road. He may have few lines to throw in the film, but his character was essential. Barbie Forteza also did a great job in the film. Although, I find Lexi's and Derrick's performance as so-so thing. They lack emotion at some point. Nevertheless, all characters in the film were good. At some point, I am very impressed and proud with this film. I just expected it to be more that what it used to be. At last, GMA Films is bringing the Pinoy Horror Genre onto a whole new level. I still admire how Yam Laranas treated the film. It is far way better than "SIGAW" which is still a good horror flick for me. It is very distinctive.